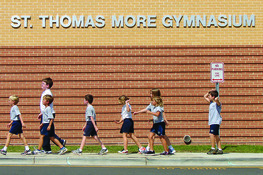 St. Thomas More School’s After School Enrichment program engages students in fun activities that create a desire to discover and build upon what they learn during the school day. Let your kids challenge themselves and find new ways to explore their interests in any one of our amazing clubs! CERAMICS, CHESS, MARTIAL ARTS WITH CHAPEL HILL QUEST, RHYTHMIC GYMNASTICS, SHOW CHOIR, SPANISH WITH IMMERSION ISLAND, SCIENCE WITH OUTDOOR STEM ADVENTURES School clubs are independently run, each with their own session dates & times. To enroll or ask questions, please contact that club directly. On the day of their club, enrolled students will be called at dismissal in STM Hall and taken to their assigned location. Parents are responsible for pick up at their child’s assigned location at the agreed upon end time. Any child picked up more than 10 minutes late three times/session will be asked to leave that session with no refund. No clubs will be held on half-days or school holidays. We hope you’ll consider joining in the fun & excitement of the STM After School Enrichment Program! As we continue to add more opportunities in the arts, sports, and sciences throughout the year, please send us your questions and feedback at stmase@googlegroups.com.